When Mrs. Topper (Billie Burke) catches her husband (Roland Young) with the ghost of Marion Kerby (Constance Bennett), she flees to France to obtain a quick divorce; meanwhile, her conniving friend (Verree Teasdale) arranges for a faux baron (Alexander D’Arcy) to woo and marry Burke for her money, and Marion does what she can to help Topper (Young) win his wife back. This sequel (the first of two) to the enormously successful comedic fantasy Topper (1937) is tiresome on every level. The storyline is weak and utterly predictable; the characters are — without exception — annoying cliches; and none of the cast members (either principals or extras) react to the proceedings in a remotely realistic fashion. Roy Seawright’s Oscar-nominated ghostly “photographic effects” (which made the original Topper such a delight for audiences at the time) quickly become boring: one can only watch so many items drifting through the air on invisible wires before the “joke” becomes stale; and while Young’s slapsticky pratfalls were amusing in the first film, they’re overused for laughs here. As usual, Burke’s bubble-headed socialite (“Too bad the people in America aren’t French”) is insufferable, and reliable character actors Franklin Pangborn (with a bad French accent) and Alan Mowbray are simply wasted. 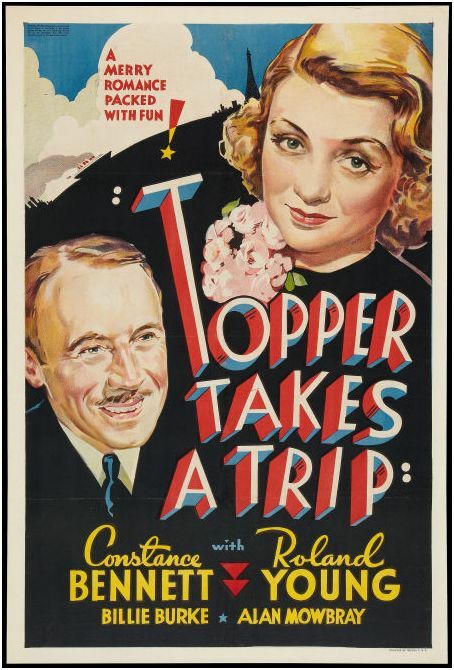 Topper Takes a Trip is, unfortunately, “comedy” at its low-brow worst, and certainly not must-see viewing. Definitely not. While I can excuse Peary for listing the original Topper in his book as must-see viewing, his inclusion of both its sequels truly baffles me.